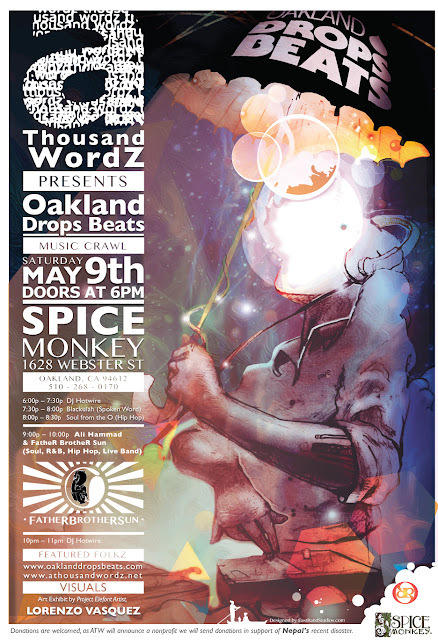 May 9th, 2015: Oakland Drops Beats music crawl. Address: The Spice Monkey is located at 1628 Webster, corner of 17th St at the border of Oakland’s Uptown and Downtown districts in an architecturally delightful former 1930’s art deco tile showroom. We will identify and announce a non-profit organization working closely with Nepal to support them in there time of need and disaster, and collect donations to send them at this event.